After a few barren days and still no sign of a single Wheatear I decided to bite the bullet and go in search for one where regular sightings had been noted. It was also the same spot where three Ring Ouzels had stationed themselves for the past week. 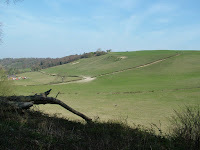 So this morning with the sun out and brilliant blue skies once again, I set off for Nore Hill near Chelsham. Not an easy place to find I discovered. It wasn't helped by the fact I'd memorised the map and didn't take a copy. I also forgot to take the Ordnance Survey map. After about 40 minutes of wrong turnings, I came across a track that was gated off. No signpost to say if it was Upland Road or not, but it looked like the right place. So off I walked. After about 20 minutes I came to the south-facing side of a hill. Nothing to be seen, but it looked promising. After another detour without much success, I followed the trial of a walker across a sloping field. Behold, a Wheatear. At long last, a handsome male was standing in the grass 25 yards ahead of me. I kept walking but wasn't convinced I was in the right place. So if proved. I stopped a farmer in his Land Rover, who knew what I was looking for and he headed me in the right direction. Another mile later and I was at the foot of Nore Hill. Bloody hell. It looked big and steep. I scanned the area but could see diddley-squat. The area was so vast, it was like trying to find a needle in a haystack, but there was nothing for it but to head up the side of the hill. I dragged my carcass every-which-way, but no sign of the prize. So, with time getting on (I had work to do this morning) I staggered across the top of the hill towards the hedgerow before starting down the slope and back to the car, which was bloody miles away. At least I'd seen a Wheatear. 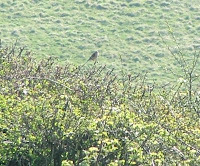 I gave the area one last scan, and then a movement to my left up in the hedge grabbed my attention. 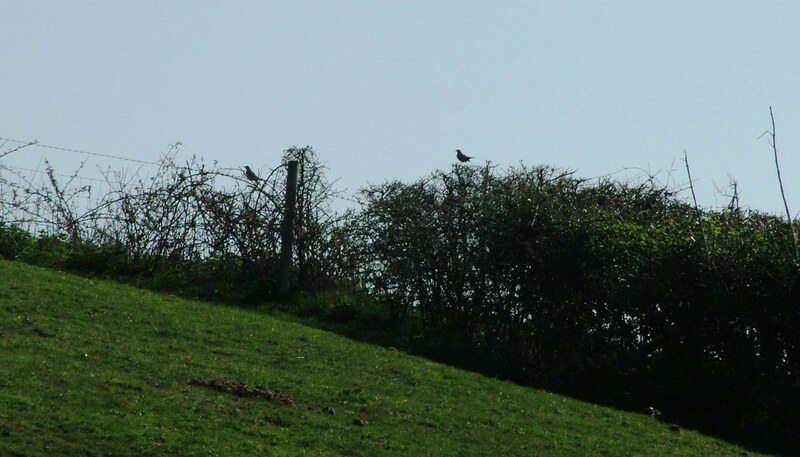 And there they were, the Nore Hill Three Ring Ouzels, two in the hedge and one on the ground showing his distinctive white necklace. A really lucky spot, but perserverance had paid off in the end. They were skittish and would move at the slightest movement. As I got closer they suddenly flew off in convoy across to an adjacent hillside. So that was it, but for one more enigmatic moment. 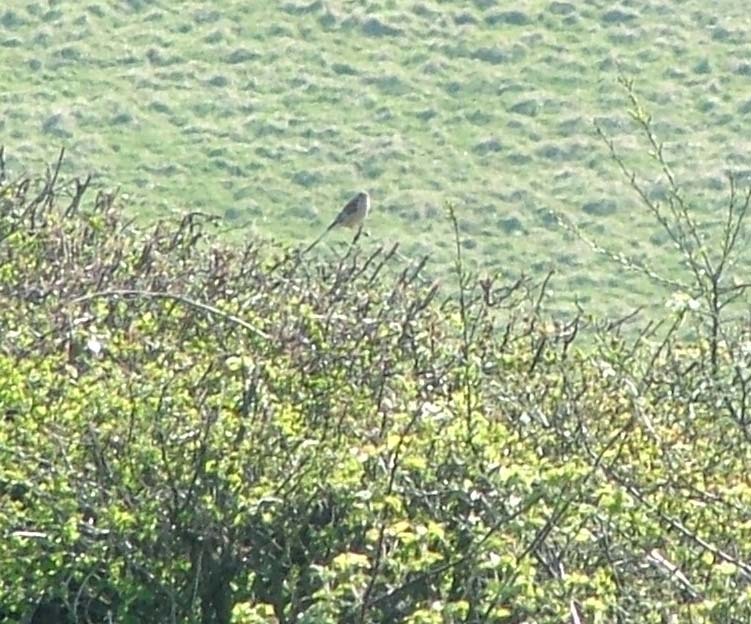 I spotted a bird a few metres down perched on the top of the hedgerow. Not sure what it was, and the photo isn't great blown up so much, but does anyone have any suggestions?